*In a medium sized software house in Wrocław, we’re currently looking for a new team member who knows how to design applications, network management tools, procurement or social platforms, and such. For those who don’t know, that means Digital Product Designer. If you want to know what qualities and skills you need to start working on such position (not only in Monterail), read on. Be a decent, hard-working, curious and trustworthy human being that excels in different types of communication and has a passion for creating interfaces for other, diverse human beings. I discovered podcasts and listened Design Details with Laura Helen Winn (go check it out, it’s lovely), co-author of “Learn the secret handshake”. This triggered thoughts about the subject of getting a job. So. A lot of things to consider. I also thought about what I—personally—want in a designer. What could I tell other people to help them? My—sort of—secret handshake with you. Who am I to give you such tips? Head of Design and Product Designer at Monterail. Halftime “The Good Advice Uncle” of the company and guardian of the design team, half time ordinary designer. Nice to meet you. 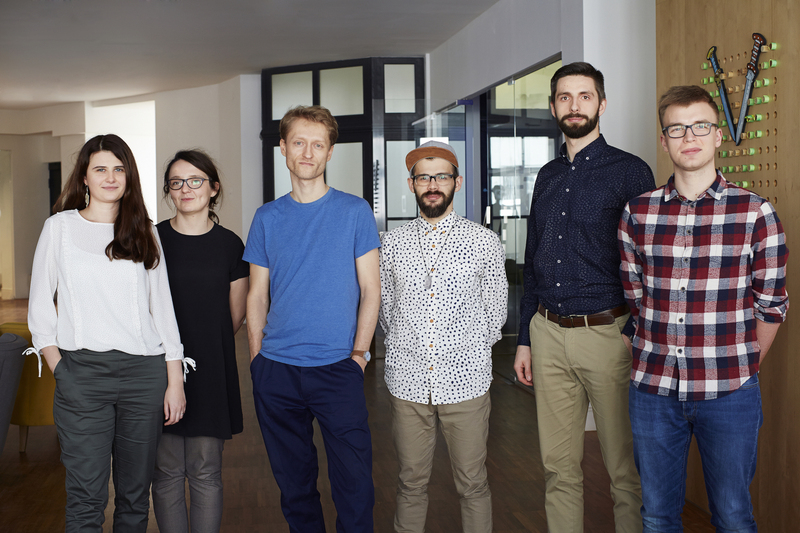 That’s the Monterail product design team. Hi there! Why am I writing those tips? I like to write, although never have time to actually write anything because it takes me just too damn long to finish writing. First time in a year and a half I need a new designer. So, yeah, seems pretty self-explanatory. I’m a firm believer that you need, want and should work with people that you are comfortable around 5 days a week. People that you can talk with on a variety of subjects, not necessarily related to work. People that you can joke with, play table football with, ride 70km on a bike through woods or casually throw a frisbee at a park. All of this develops relationships and connections that allow for deeper and better conversations when it comes to finding or solving problems. You have better speed. It’s unbelievable and important. When you are about to step into a room with a client for two days, you want to know that you can trust fellow coworkers. That you can communicate with the slightest gesture. Take the “short version” list from above and go through it. If most of the points don’t apply to you, maybe it’s not the right fit. If some of the points don’t apply, that’s ok. I’m probably not that perfect either. But you have two points of contact: “the mail” and “the meeting” (if you go through “the mail”), so don’t waste those. Show me yourself, not your assumed vision of what you should be, to win the recruitment. If you’ll fool yourself and me, and win the recruitment in the process, you’ll do both of us a great disservice. Be yourself and win with that. I’ve seen applications that didn’t have portfolios attached. How can anybody think that they can win a design job without showing their actual work? I’ve seen CVs so ugly, that I just couldn’t go through. Not-ugly CV doesn’t mean I expect overdesigned pieces of self-indulgence (branding yourself is rather a no-no). I expect something that will do the job. And honestly — if I need to teach anyone the principles of design — use of typography, hierarchy, color, structure, goal, etc. — then, well. On the other hand, if you want to prepare a CV in a form of an app, or come up with something totally bonkers, be my guest. Passion and hard work are highly appreciated if it hits the mark. There are two ways of finding a job. Throwing a huge number of generic CVs out to the world to see what sticks. Peering into yourself to know what you really want to do and devoting yourself to getting there. One company at a time. Monterail is a software house. We are not a design agency. Clients don’t choose us to fix or find problems for them. They come to us because they want very specific applications. We will give them our best expertise possible and solve some of their problems in the process, but all in all, we specialize in producing high-quality web tools for people in very specialized environments. Often times without access to end users. Getting a job is, often times, as important as doing the job. Just shorter. Of course proportions vary dramatically. Some of us specialise more than others and spend a lot of time doing only some of those actions. Not a joke. We’re not looking for behavioral scientists or user experience researchers (although experience in those fields is HIGHLY appreciated). We’re looking for a Designer. Product Designer. A person that, first and foremost, craves and excels in creating experiences through interfaces. That means, and more on it in my post about design definition, a person that wants to be involved, asks questions, can be relied upon and finally can take whatever tool necessary to create an app. A creator. So there you have it. I hope it helps.